The READ therapy program was started in 2006. Volunteer teams of trained owners and their Delta/Pet Partner-registered dogs or cats read with children to promote literacy and nurture a love of sharing the books with some wonderfully attentive therapy pets. They visit public libraries in Chicago’s western suburbs and participate in special programs at schools and other educational settings. During a typical session, the child sits comfortably on a blanket with the team. The child then reads to the pet while the owner asks the child comprehension, vocabulary, and pronunciation questions, framing them from the pet. For example, “Fido is getting pretty excited! Can you tell him what you think will happen next?” Or, “Fido can’t read that word, it is too difficult. 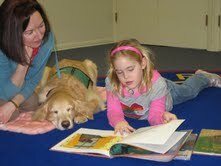 Can you sound it out for him?” This program really works because children feel relaxed, comfortable, and safe with pets. Pets are fun! They don’t laugh at mistakes and make no judgements!! READ visits typically last about an hour and are made on weekday evenings and Saturdays. Teams are requested to commit to one visit a month, but some volunteers enjoy going more often. All human volunteers must follow the Pet Partners Read with Me ™curriculum and complete an assessment review with the Pet Therapy Coordinator to ensure they understand the skills required to engage the child and aid in their reading. All pets must have current Delta/Pet Partner registration. The Hinsdale Humane Society regularly offers READ program orientation for you and your Delta/Pet Partner registered pet and assistance with the registration process. We encourage you to join our team as a READ volunteer or facility.